I had been trying to think of a way to put down (in one, short sentence) how I feel about strolling around in Downtown Mount Clemens. Then, just last week, someone did it for me. I was with my friends, Steve & Kristy, prior to taking in the second-to-last showing of The Fantasticks at the Box Theater. We had just left Seeburger's Cheeseburgers and, as we walked strolled past Used-on-New Books & More, Kristy mentioned that she had been looking for a little bookshop in the area. Then, she burst out with a big smile and remarked, "I feel like I'm on vacation!" See, I get that very same feeling in my own figurative back-yard. I just couldn't put my finger on it... that is, until Kristy put it into words in just the way that she did. I love small-town business districts. All the shopkeepers and restaurant owners know each other. More than that, they form a community. They are all in it together. When strolling through downtown Paradise, Central Lake, Bellaire, Leland, Copper Harbor... I always get that same feeling. There is an atmosphere of friendliness, an air of comfort. Yesterday, while I was downtown, I saw a sign in the window of Champagne Chocolates that I had never noticed before. 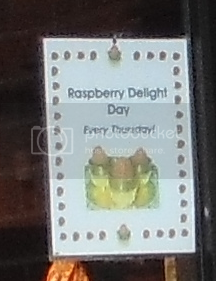 It reads, "Raspberry Delight Day Every Thursday". Of course, I had to wander in and ask what that is all about. I was told that it involves a dark chocolate cup topped with a Fresh raspberry. This sounds delicious... and, since tomorrow is Thursday, I think I will toddle on down and try one. While I was there, I found that all of their Easter treats are on sale at 50% off! They still have a lot left, but I don't think it will last too long... so get it while you can. After I left, I strolled over to Max & Ollie's Vintage Boutique to chat with long-time friend, Diane Kubik. She had a sign out front which proclaims "25% off jewelry", a sale which she'd told me is good until the end of the day, on Saturday. While I was there, Catherine Gulette from the neighboring Gemini Moon shop came in to talk to Diane about their concern for injured members of the business community. One of them is Nick, a waiter at Bath City Bistro (if I understood correctly) who was recently in a terrible motorcycle accident. The other (I learned later) is Rick, owner of the Detroit Pub, who suffered a heart attack. I am moved by the deep concern these people express for each other and the outpouring of love and support visible to me on Facebook. I walked in to Gemini Moon to see what's going on over there, and I find that they are still running their 60%-off-sale on the delicately beautiful Egyptian oil burners, glass bottles, and papyrus. I love the tremendously positive energy of that place. Having a bad day? Ask them about their Stone Circle. Lastly, let me not forget to remind you all that what happens at Weirdsville Records every Thursday night at 8:00pm is Weirdsville Movie Night! Tomorrow night's movie is Head, the 1968 Monkees movie... with Victor Mature, Sonny Liston, Annette Funicello, Carol Doda and a guest cameo by none other than Frank Zappa, himself! You dare not miss this!